A four - plated Barnacle species / "Elminius Modestus" / arrived from Australasia, in the 1940's , identified near Southampton and rapidly spreading .They are filter feeders , the barnacle reopens as the tide rises , using 6 pairs of feathery legs sweeping through the water catching food (plankton and detritus) from the water. The particles are passed to the mouth which is inside the shell plates. 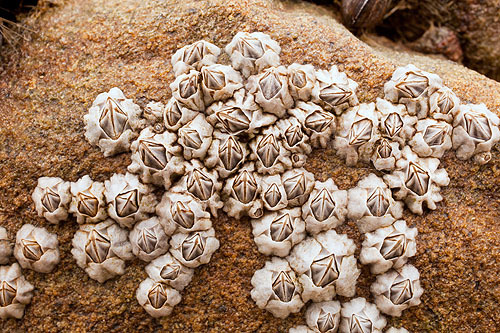 Unlike other Barnacles it never seems to stop breeding , releasing successive broods throughout the year , when the water temperature exceeds 6 degrees C.